Capture 360° underwater video and photos at depths up to 3280' using six GoPro HERO3, HERO3+, or HERO4 cameras in the 360Abyss Scuba 360 Professional Pack from 360Heros. This kit bundles the 360Abyss v4 housing, polycarbonate doors, a spare dome lens port, extra O-rings, and a 1560 Pelican case with custom-cut foam. Compared to the previous generation, the 360Abyss v4 features Bullet360 control boards that allow you to simultaneously operate all six GoPro cameras, even while underwater, using an included magnetic control wand. 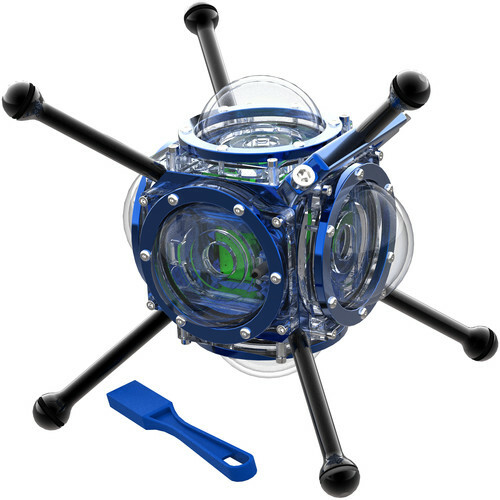 The 360Abyss positions six separately-available GoPro HERO3, HERO3+, or HERO4 cameras in a spherical orientation to capture deep-sea video recording on scuba trips and other underwater adventures, which can then be stitched together using post production software to create 360° videos. The housing is constructed from anodized aluminum and polycarbonate doors that produce a neutral buoyancy to depths of 984' in salt water. Camera domes are constructed from a mixture of acrylic and polycarbonate for high-strength and optical clarity. Each camera is housed in an isolated individual compartment, so a single leak won't cause harm to more than one GoPro. Optional, interchangeable, 55mm color-correction filters can be placed inside each dome to restore hues that get absorbed beneath the surface to produce rich, more natural-looking images. CY blue-water, GR green-water, and SWCY shallow blue-water filters are available for specific environments. Eight standard threaded 3/8"-16 corner mounts allow divers to connect the 360Abyss to a tripod or tray, while a 45° side mount attachment enables mounting to submarines, ROVs, and other underwater vehicles. The 360Abyss, cameras, and accessories can be stored and transported safely in the included Pelican hard case with protective foam. Note: In order to stitch the footage together from all six of your GoPro cameras, separately available software is required. Box Dimensions (LxWxH) 22.2 x 18.4 x 10.8"
360Abyss v4 Scuba 360 Professional Pack for GoPro Cameras is rated 3.0 out of 5 by 2. Rated 5 out of 5 by Scuba Bob from the Scuba Show from Great marine VR product! I rented this rig from the LA office from 360Heros and was extremely impressed with the results. I really like the idea that it has individual compartments for the cameras. New control boards they built to run the cameras under water was super easy to use and it saved on my battery life. I filmed almost 50 minutes of footage with with 12 different takes. The only con I had was the O-rings for the doors kept falling out assembly but I believe this was because they were well greased and new. Once I figured out what to look for it was a simple assembly. Thanks Bill Macdonald for your support on the product. Rated 1 out of 5 by El Padrino from Not Updated for HERO 5 !!! This old housing does not work with the HERO 5 !!! Interested to buy the 360Abyss v4 scuba 360 professional kit,but i have a question?what is the specific sothware for stitching the whole video? Kolor has been discontinued by GoPro... I believe Kolor AutoPano no longer exists. GoPro owned it and discontinued it and as of 2018 it doesn't exist. I searched the 360 site and even the new products that use hero6 GoPros... they talk about how they stitch it with Kolor Autopano which you can no longer buy and isn't supported. If anyone knows any other options I'd love to hear it... but I believe this product is unusable unless you have an old video stitcher from GoPro that hasn't been deleted.